A surprisingly sweet root salad with a flavor (and color) pop. 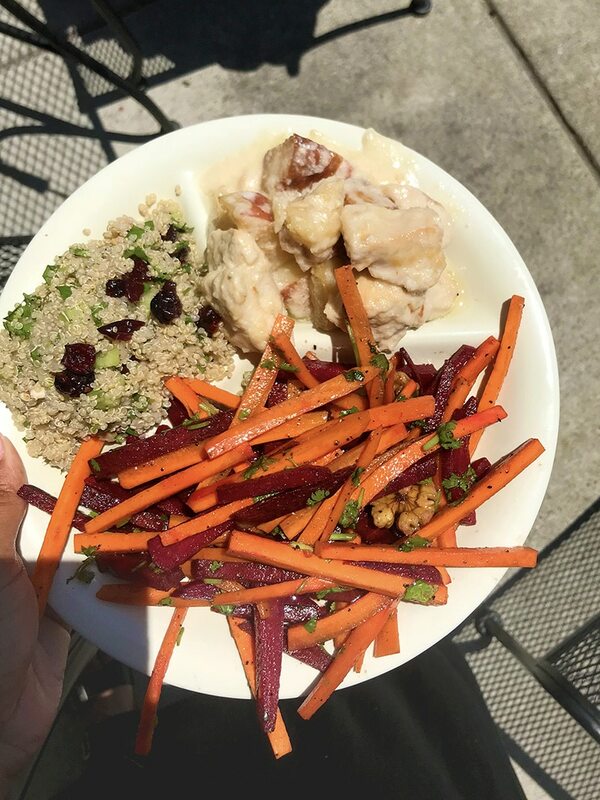 The colorful and flavorful combination is pretty to look at but even more vibrant on your taste buds. Just because I operate in integrity, I am letting you know that this post is filled with my true, honest opinion and experience at Sassool Mediterranean Cafe. Out of the kindness of their hearts, lunch was provided at no charge. A special Thank You to the family for welcoming me to their place! My husband and I often talk about legacy and working to leave the kids something. I think far too often today we as a people get caught up in giving our kids immediate gratification and don’t think about the long term. A few days ago I had the opportunity to visit and tour Sassool Mediterranean Cafe here in Raleigh. It’s a cross between fast food and casual dining in a cafe that offers a twist on traditional Mediterranean foods produced from their very own family recipes and traditions. While their food is pretty darn good, being the person I am, I was actually truly wrapped up in the story tied to the cafe as well. 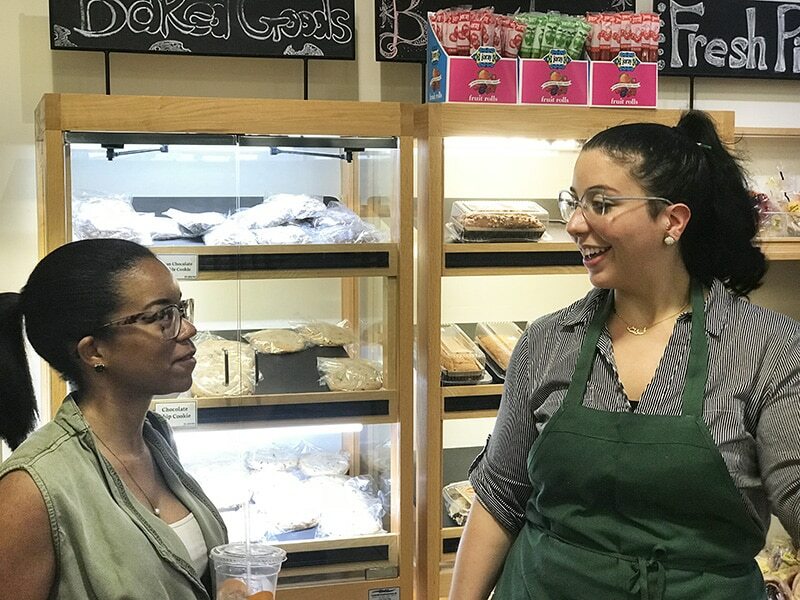 Sassool was introduced to the triangle area in 2014 when Mounir Saleh branched out from the family business and long-standing community staple, Neomande Restaurants and Artisan Bakery. The cafe is named after the Saleh brother’s mother Cecilia, who is nicknamed Cecilia. 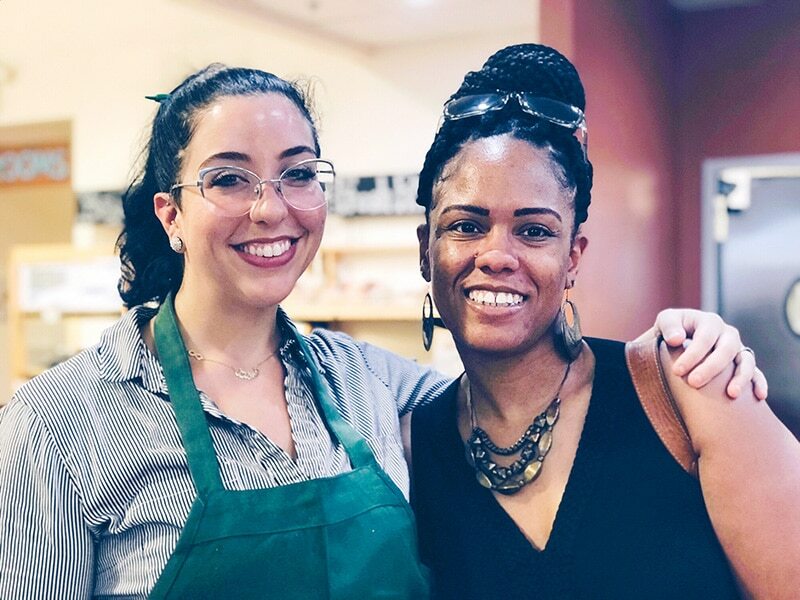 I had the chance to meet and chat with Noelle, daughter of Mounir, who runs and operates the Raleigh location. There is also a location in Cary run by her sister, and there will soon be a part of the upcoming Morgan street Market. With a “Sassool Express” concept. But one thing that I got in reading about the history of the restaurant and then talking with Noelle is that legacy and family are very important to this family. And not just their family, but yours too. I also had the chance to meet Mounir and one of his brothers briefly. Greeted with smiles and kind words, I could tell they still had the passion for the business I imagine they had when they got started. And in speaking with Noelle, they have passed that on to younger generations of their family. That’s legacy. And it’s truly a legacy of love as Sassool is noted as being dedicated to Cecilia and her love and special care for cooking good food. After having the chance to meet Noelle and her dad and being so welcomed, shoot I’m practically family too now. And if you don’t believe me, I have a recipe here straight from Sassool’s kitchen to share with you. Now would I have that if I wasn’t family? Anyhoo, here’s the Root Salad recipe straight from Sassool that you can prepare and enjoy with your own family and be inducted into the Sassool family just like me. 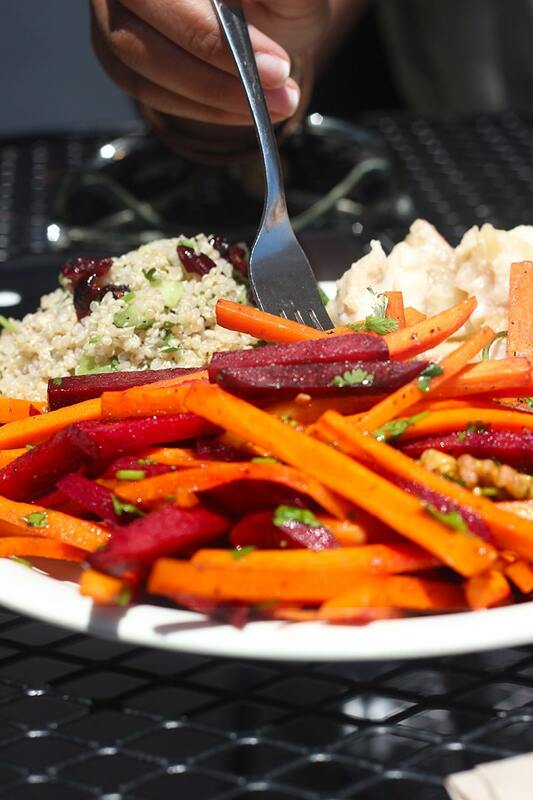 I had the Root salad, Chicken and Potatoes in Lemon Garlic Sauce and Quinoa Salad from Sassool Cafe. Peel the raw carrots and beets. Chop into matchstick size pieces and set aside separately until ready to mix the salad. Remove the bottom of the cilantro bunch and rough chop. 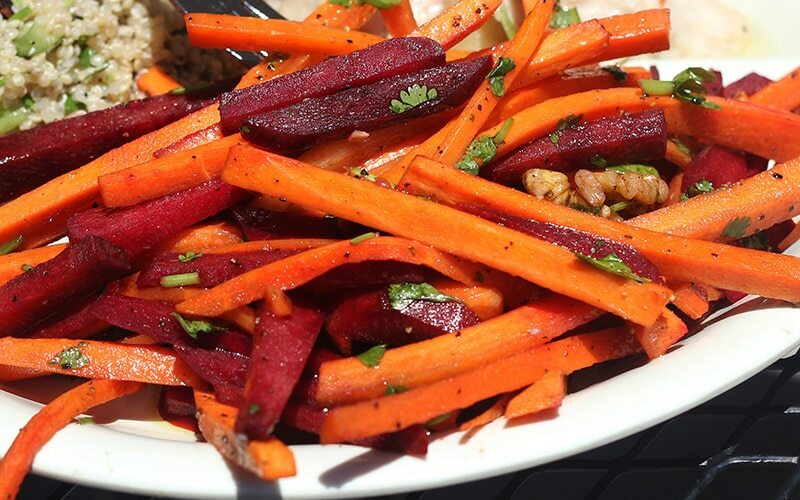 In a large mixing bowl add the carrots, beets, cilantro, and walnuts. Pour the olive oil, pomegranate molasses and vinegar in a circular motion to cover each section of the root salad. This is an original recipe of Sassool Mediterranean Restaurant located in Raleigh, North Carolina. It has been published with permission. Sassool menu has an extensive selection of flavor packed items. 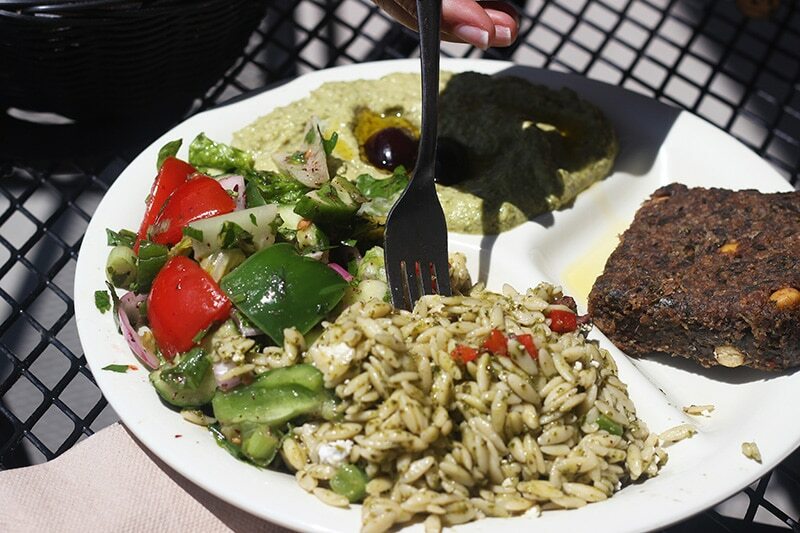 Niki had the Jalapeno Cilantro Hummus, Orzo Pasta Salad, and Veggie Kibbeh. 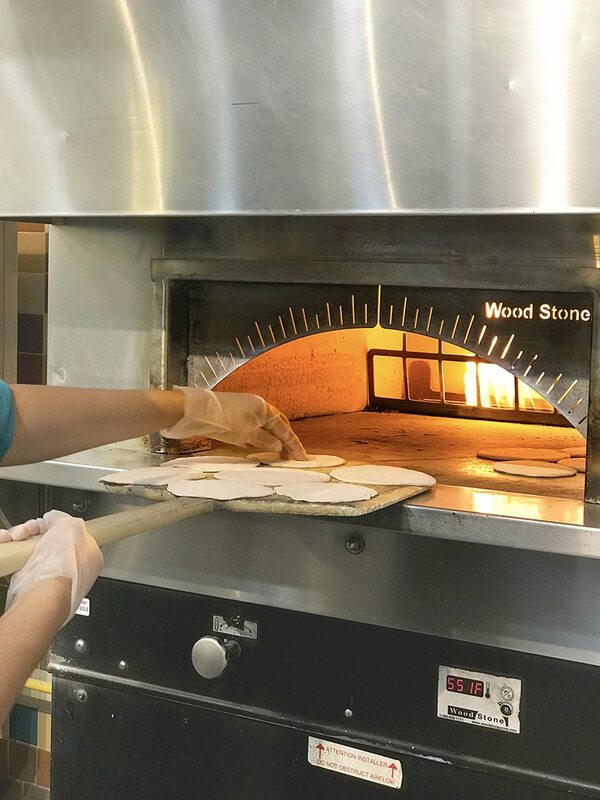 …and did I mention there is fresh Pita Bread baked in-house?!?!?! The cafe also offers a market filled with ingredients found in their own recipes, baked goods, and other specialty items. 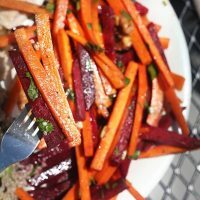 Interested in making the Sassool Root Salad Recipe? Pin it for later to enjoy at your next family meal gathering. Do you enjoy Mediterranean cuisine? Comment below and tell me what’s some of your favorites so I know what to try next? I was so excited to find this recipe! My 3 year old and I love this root salad. I am going to make it this weekend. Thanks so much! It’s soooo good! You are so welcome! You are soooo welcome! It is pretty delicious, I have to agree!